The nuclear bombing of Hiroshima is the bracketing of one age from another. Up until the moment of its use, despite the unspeakable horrors of two world wars, wars between advanced industrial countries still had their apologists. After Hiroshima, outside the mad generals of the Dr Strangelove school of thought, such an idea became insanity - MAD even. 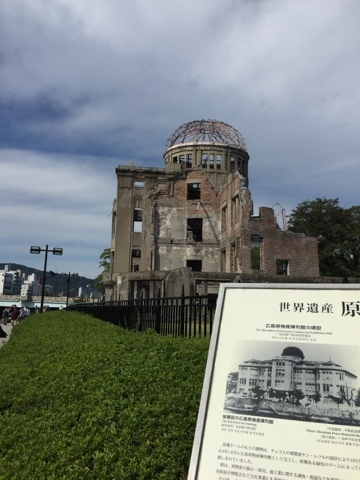 We visited Hiroshima last week. Seeing the photographs and hearing testimonies of civilians who survived with appalling injuries, or life destroying trauma, inevitably begs the question of why it - the nuclear bombing of a city - was necessary. The use of the Bomb, once invented, was surely inevitable in some form to cower the Japanese into surrender - but why not a demonstration on a purely military target - or with a warning to the city population? Having read around this there were a number of reasons. The first concerns the bombing of any city by whatever means. It is often forgotten that, at the beginning of WW2, the bombing of cities at all was regarded as a uniquely German or Japanese (in China) barbarism. Guernica was a fresh memory and the bombing of Rotterdam universally condemned. Coventry and the Blitz, the obviously existential nature of the conflict and the offensive impotence by Britain by other means, changed attitudes. Bombing was the only way to carry the war to Germany. There was a problem: bombers couldn't hit targets smaller than a city with any accuracy. So area bombing, and the mistaken belief that bombing could destroy civilian morale, led from Hamberg, to Berlin and ultimately to Dresden. On the 9th March 1945, the USAF drenched Tokyo with napalm and phosphorous, burning to death over 100,000 civilians in one day - many more than died in Hiroshima. There were very few dissenting voices among the allied nations at this sort of slaughter. Hearts were hardened by that point in the war and Bomber Harris's brutal quip about no German city being worth the bones of a single British Grenadier went more or less unchallenged. Tokyo, Hiroshima - one more city. Secondly, there was not a sense before Hiroshima of anything uniquely terrible about nuclear weapons. Bigger, much more destructive individually to be sure - but just one more ghastly way of killing. The dangers of short term radioactivity was not appreciated: you have only to see photographs of Oppenheimer and Groves, the twin guiding forces behind the Manhattan Project, standing on the Trinity test site the day after the first detonation to appreciate the veracity of this. It was only afterwards that the scale and the poisoning began to be appreciated. The use of the bomb was accepted as inevitable but it's precise deployment was an operational decision made at theatre level, not as often thought, in the White House - for all the reasons above. Dropping the bomb on a lightly occupied area with a warning was considered. The principle reason that this did not happen was because the Americans were (justifiably) uncertain that it would work in bomb form: the Trinity test in New Mexico was detonated on a stationary tower. The reasoning was that it would be counterproductive to say you were going to deploy a super-weapon and for it not to go off - or for its power to be unappreciated. It would also invite attempts to shoot the bomber down - maybe by kamikaze. The objective was 'shock and awe,' to make the Japanese capitulate without the necessity of an invasion of the home islands that, given the experience of Okinawa, would surely have cost millions of lives. It's use pushed the Japanese over the edge, to 'think the unthinkable' as the Emperor put it. There are so many 'what ifs' and counter-factual arguments around the destruction of Hiroshima. But given the circumstances of the time, it is hard not to believe that it - or something very like it - was inevitable. None of this can ever expunge the horror of what happened, in an instant, on that epochal August day in 1945.